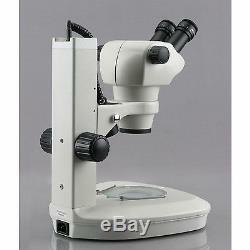 AmScope SF-2BRA 8X-50X Track Stand Stereo Zoom Parfocal Binocular Microscope with LED Lights. Please note that we cannot honor warranties for other sellers' products! 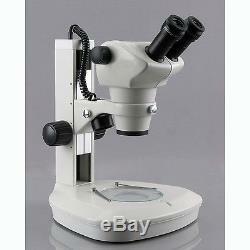 8X-50X Continuous binocular parfocal zoom magnification power. Extreme widefield optics offering crisp clear stereo images. 4.5" Working Distance with large 1-1/4" field of view. Sturdy track stand with top & bottom LED lights. New to the AmScope line-up, this precision instrument is a high quality 8x-50x binocular stereo zoom microscope, and features extreme widefield optics, both incident (top) and transmitted (bottom) LED lighting systems, and a convenient track stand for easy focusing. Optically, the large zoom magnification range of 8x-50x maintains focus at a 4.5 (115mm) working distance. This confocal feature provides ample room for various sample sizes, and with its 360 degree swiveling head and 45 degree ocular tubes, the ultimate experience in comfort can be achieved to your liking. For illumination, a 2-3/4 (70mm) LED plate is installed, providing ample lighting. These features all add up to a great microscope for industrial, educational, and professional applications for research labs, hospitals, schools, veterinary offices, and more. Because of the LED lighting system's lack of heat emission, it becomes extremely useful for organic or temperature-sensitive applications, such as live tissue dissection, or observing live organisms, such as insects, plans, or virtually any translucent object. Our new stereo microscope provides all the features of a high quality laboratory instrument at an affordable price, all while coming brand new in a factory sealed box. 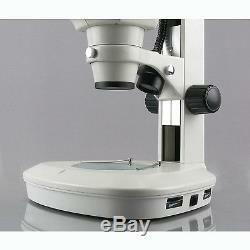 A great microscope with erect sharp stereo images and low heat releasing. Contemporary brightness-adjustable LED top & bottom illumination. 8X-50X large confocal zoom range continuous magnification. 45 degree inclined 360 degree swiveling binocular head with extreme widefield eyepieces. 30mm extreme widefield focus-adjustable eyepieces. High resolution with great depth and contrast. Crystal clear original true color images. Adjustable diopters on each ocular tube. Metal track stand finished with a stain resistant enamel. Accurate alignment ensures fatigue-free viewing. Full optical and precise ground glass elements. Manufactured under restrict ISO 9001 quality control system. Head: 45 degree inclined 360 degree swiveling binocular. Eyepiece: 30mm extreme widefield focus-adjustable 10X/22. Interpupillary Distance: 2-0" - 2-15/16"(52-75mm). Working Distance: 4.5 (115mm). Lights: LED, incident and transmitted. One Binocular Stereo Zoom Head. One Pair of Extreme Widefield Focusable 10X Eyepieces. One Track Stand with LED Lights and Focusing Rack. Follow the issued instructions, and once received, we will process the item in, and check to ensure everything is there. Processing is done first come, first serve, and can take between 1-4 weeks to process (depending on how many requests we currently have in queue). We thank you for your patience while we work on your request. 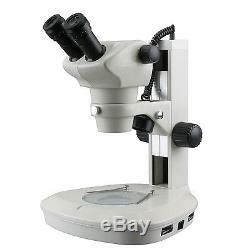 The item "8X-50X Track Stand Stereo Zoom Parfocal Binocular Microscope with LED Lights" is in sale since Tuesday, September 20, 2016.